Combine the oats, nuts and seeds in a large bowl. Combine the apple juice, maple syrup, coconut oil, vanilla extract, cinnamon, sea salt and black pepper in a medium saucepan. Gently heat all together until salt is dissolved and coconut oil liquified. Pour liquid over the dry ingredients and toss to coat. Spread the mixture evenly on a baking sheet. Bake for 40 minutes until golden. Make sure to stir the mixture about every 15 minutes to make sure it is evenly baked. 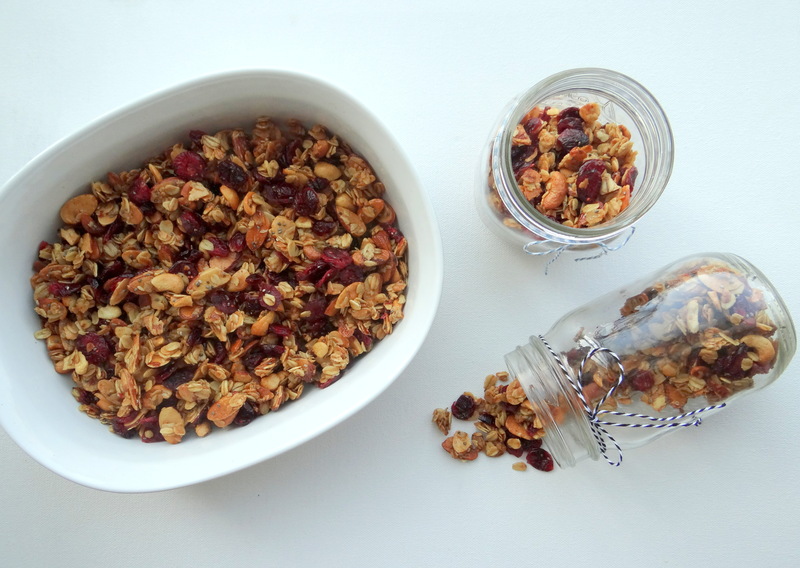 Let the granola cool completely. It will become crunchier as it sits. Stir in the dried fruit when completely cool. Store in an airtight container for a few weeks. Serve with fruit over yogurt or milk. Previous Postthank you Rachael Ray Magazine!